14 June 2016 – Watlington, Oxfordshire, UK and Kungsbacka, Sweden – Traditional stores could be the ‘weak link’ in Swedish retailers’ omnichannel chain, new research from iVend Retail, a global retail solution brand, and Retail Store, a Swedish retail systems provider, suggests. The original research from iVend Retail and Retail Store warns that, despite Swedish retailers’ efforts to integrate omnichannel journeys, consumers are increasingly disappointed by their in-store experiences when compared to online. This, the research suggests, is because the data that retailers can gather around individual shoppers’ behaviours online – from frequency of purchase to purchase history and buying preferences – which allows them to deliver the personalised engagement shoppers have come to expect, disappears when the same customer enters a physical store. Research from the report reveals that while 51% of Swedish consumers still mostly shop in traditional, physical outlets, a third (32%) said they were more likely to be disappointing experience in the store than online, rising to 42% among 16 – 29 year olds. A quarter (25%) agreed that the service they received online was more personal than instore, and a further 26% said the store felt outdated when compared to ecommerce encounters. 17% even said they felt like a retailer’s ‘friend’ online, but anonymous in the store. Increasingly customers want retailers to do more to bridge the digital divide: 78% of Swedish consumers would like retailers to have a ‘single view’ of them, connecting their online and offline shopping habits to make in-store interactions more personal and deliver seamless buying journeys. 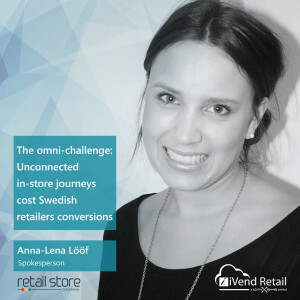 Anna-Lena Lööf, Sales and Marketing Manager at Retail Store, commented: “To reinvigorate the store and in their omnichannel strategies, retailers should look to digitalise physical outlets using customer data and a single view of stock to deliver more tailored and connected interactions. By equipping store associates with digitally enabled devices that are linked to back-end systems, they can bring the online experience to customers at the shelf edge, keeping the customer on the path to purchase. “By using technology to enable physical stores to behave in the same informed, flexible manner as online shopping channels, retailers can improve omnichannel conversions,” he concluded. Retail Store was formed in 2004, bringing industry experts together to help retailers in the Scandinavian marketplace. Our mission is to increase the profitability of retailers in the region by delivering systems and services through partnerships with market-leading vendors. With extensive experience in consulting, implementation and system development, Retail Store offers a complete solution for the retailer, backed by high-class service and support. The Retail Store customer base already includes some of the region’s best-known retailers and most recognized brands.